Your Portfolio on the go! With the Investment Scout App, you can keep your product portfolio with you at all times and actively monitor your products throughout their entire lifecycle thanks to push notifications. On the derinews-blog (only in German) you can read interesting investment ideas, exciting updates and facts on the move on a weekly basis. Take advantage of market opportunities and use your smartphone to quickly and easily create your individual investment certificate. 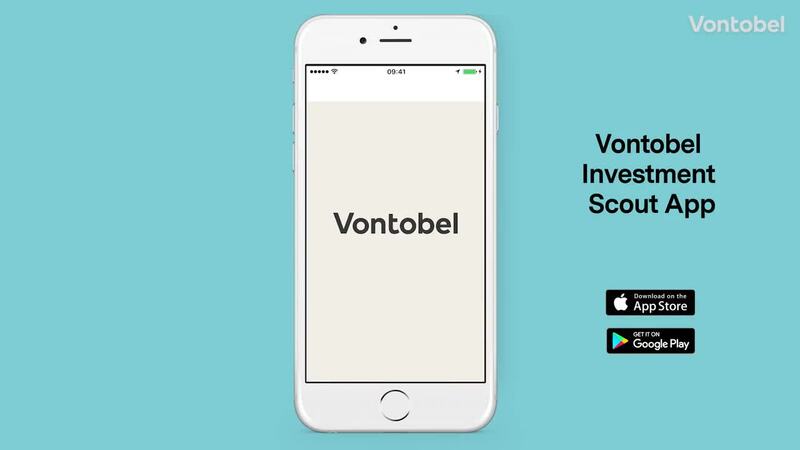 Thanks to Vontobel SmartGuide technology, you can find investment opportunities based on your personal preferences every day. You create your individual product without obligation and can then buy it from your bank. Manage your product portfolio and monitor performance in the app and on derinet.com. Push notifications for monitoring the entire product life cycle. Construct and order investment products yourself. Investment opportunities are based on personal preference thanks to SmartGuide technology. © Vontobel Holding AG 2019, Derivative Products. All rights reserved. The information on this Vontobel website is exclusively intended for people with registered domicile/place of residence in Switzerland. Visitors from other countries are not permitted access to the Vontobel website. When accessing this website of companies of the Vontobel Group you declare to have understood and to recognise the following conditions of use and legal information. If you do not agree to these conditions, do not access this website. All copyright and other rights on the entire contents of this website are exclusively and completely reserved by Vontobel Holding AG. "derinet", "Vontobel" and the Vontobel logo are registered trademarks. By using this website, the user will be granted no rights to the content, to the registered trademarks or to any other element of this website. Downloading or printing of pages is only permitted with full reference to the source. Any other use, in particular complete or partial reproduction or publication for a public or commercial purpose, is only permitted with the prior written agreement of Vontobel Holding AG and with full referencing. The information and opinions published on this website in no way constitute a request, offer or recommendation to use a service, to purchase or sell investment instruments or to carry out any other transaction. Financial products shown on this website involve a high degree of risks and may not be suitable for all investors. This website is not an investment advisor or any other decision-making aid for financial, legal, fiscal or other consultancy questions. Neither does this website replace qualified advice necessary prior to making any investment decision, especially relating to any associated risks. No investment or other decisions should be taken based on this website. We would like to stress that past performance is not necessarily an indication of future performance and assume no liability, neither formally nor by implication, and no guarantee with regard to any future performance. Vontobel does in no way guarantee the correctness, reliability or completeness of the information and opinions published on the Vontobel website or of any results gained by use of this website. All available information, such as for example financial market data, market prices and any other financial market information, is based upon or by reference to carefully selected sources which are believed to be reliable. Any expressions of opinion, assessments and outlooks originate from its authors and date back to the respective date of issue. Vontobel bears no obligation or responsibility with regard to the updating or correction of such information. This website may be amended and modified without prior notice at any time. Moreover, Vontobel accepts no responsibility and gives no guarantee for the correct or uninterrupted functioning of this Vontobel website, for the rectification of any errors or for the freedom of this website or the servers from viruses or any other harmful elements. Vontobel is not liable, even in case of negligence, for damages or consequential damages resulting from, or in connection with, access to or use of, or the impossibility of access to or use of, this Vontobel website. Vontobel has not checked the other sites linked to this Vontobel website and is in no way responsible for the content of these websites. If you activate certain links, you leave this Vontobel website at your own risk. Vontobel does not exclude the possibility that, under certain circumstances, e-mails sent to the Vontobel Group may be read, amended, diverted, falsified or destroyed by third parties. Vontobel refuses all liability for the transmission of data by e-mail.